Our no lock-in plans have flexibility built-in and are perfect for renters, movers and shakers. Renters get all the Speed, data and quality benefits of our contract plan, without the commitment. Simply select the ‘no lock in’ contract option when you build your plan. Enjoy Ultra-Fast Fibre Pro thats 9 x faster than standard fibre broadband for only $104.99/month. 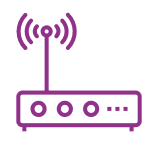 Our Wi-Fi Hub+ Modem works on both Fibre and VDSL networks, so you’re set wherever you go. No Lock-In contract for just $5 a month extra. Never run out of data- if you are in a shared house, no need to worry about data caps, all of our plans are unlimited.